Ford GoBike is off and rolling -- the Bay Area's revamped regional bike-share system launched Wednesday with a ceremony in San Francisco -- but not without running into a potentially nasty political pothole. The launch: The newly dedicated system, sponsored by and with a $49 million investment from Ford Motor Co., hit the streets with about 450 of its blue bicycles available at 37 docking stations. The new bike stations, the first of more than 300 eventually planned across the city, are located in the Financial District, South of Market and Civic Center neighborhoods. Ford GoBike has scheduled its East Bay rollout -- details to be announced -- for July 11. The system's share bikes will be launched in San Jose sometime the week of July 10. Ford GoBike, operated by New York City-based Motivate, plans to have 7,000 bikes on the street by the end of 2018: 4,500 in San Francisco, 1,000 in San Jose, and a total of 1,500 in Oakland, Emeryville and Berkeley. And now we come to the bit of rough pavement the shiny new bike system just encountered. Enter the pothole: If you've been following the Ford GoBike story, it's been kind of all good news, all the time, starting with last year's announcement that Ford would foot most of the bill for the system and continuing with the plan to offer very user-friendly rates to low-income riders. But that happy narrative changed a bit on Tuesday, when the San Francisco County Transportation Authority board voted to hold up $255,000 in clean-air funding that would support part of Ford GoBike's future expansion. The agency's board is made up of the full San Francisco Board of Supervisors. It withheld the money after Supervisor Aaron Peskin, who acts as chair of the transportation authority body, expressed concern about the effect Ford GoBike might have on the city's long-established bike-rental firms. The issue, in brief: The expanded bike-share system was offering a $15 "Go Pass" that would provide unlimited rides up to three hours in length over a 24-hour period. Rental companies complained to Mayor Ed Lee, whose office has tried to negotiate an agreement. Motivate, the Ford GoBike operator, killed the "Go Pass" in favor of a day pass similar to those offered in Chicago and New York. For $10, riders get unlimited 30-minute rides in a 24-hour period -- and pay extra if any of those rides go over half an hour. "The existing mom-and-pop bike-rental companies ... have been there forever and ever," and are local employers that are important to the city's tourist industry, Peskin told the transportation board Tuesday. Peskin said he'd been involved in "productive" talks with Motivate and the mayor's office, but that the rental companies' issues had not been fully resolved. "I want to continue to hold that $255,000, pending what I think will be -- I hate to use the cliche term -- a win-win resolution of this in the next couple of weeks," Peskin said. The board gave unanimous approval to delaying the funding, which could be considered again as early as the agency's July 11 meeting. Motivate spokeswoman Dani Simons told KQED's Jeremy Siegel on Wednesday the company doesn't want to replace the rental firms and is trying to respond to those worries. “We have had regular meetings and working group sessions with the bike rental companies, and we’re fully committed to continuing those conversations,” Simons said. Withholding the $255,000 wouldn't appear to have any immediate effect on Ford GoBike's expansion plans. The money would go to help the city's planning and permits for the final phase of the buildout in the city late next year. 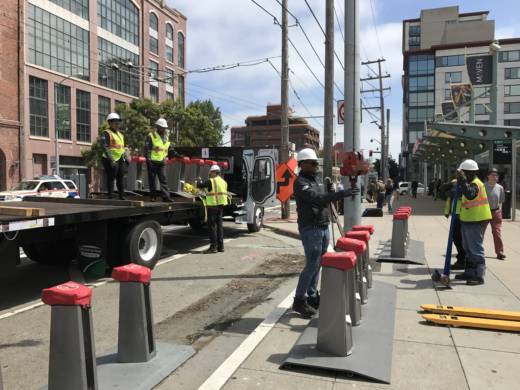 That would involve the installation of 96 bike stations and 1,350 bikes in the western half of the city -- north and south of Golden Gate Park and near San Francisco State.